In the wild west, the law of the strongest is often the best! Free your gang of crooks, neutralize your rivals, and leave the city full of suitcases! You will have to be clever and ruthless, but always in a good mood! 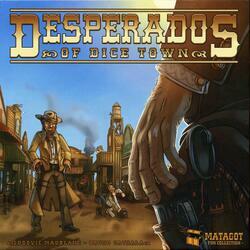 Desperados of Dice Town is an independent game that takes place in the same universe as the board game Dice Town, by the same authors and illustrator.